Devoting more than three years to gathering the world’s finest gems and creating an unprecedented high jewellery collection may not be the modus operandi of most jewellery houses. But Harry Winston took a bold gamble with its latest Legacy collection, and the results speak for themselves. As a tribute to the King of Diamonds, and his devotion to and insatiable passion for incredible gems, Harry Winston’s latest high jewellery collection is its first in three years. It is inspired by the 101.73-ct Winston Legacy diamond and the perfection it epitomises. This magnificent 22-strong line-up comprises 11 necklaces, seven rings, and four pairs of earrings, each featuring a D-colour internally flawless diamond. More than 1,600 pear- and marquise-shaped diamonds also help boost the brilliance of the central stones, culminating in an impressive total of 836.68cts. The Winston Legacy, which was acquired by the company through a Christie’s Geneva auction in 2013, was described as “the most perfect diamond ever offered for sale at auction” by Rahul Kadakia, then Head of Jewellery at Christie’s Switzerland and Americas. More than two years had been spent whittling and polishing the 236-ct rough, which was discovered in the Jwaneng mine in Botswana, to attain the brilliant pear-shaped Type IIA Flawless gem. To accentuate the Legacy diamonds with clean, fluid lines, Harry Winston’s team of gemologists, designers and craftsmen drew on the company archives and its most iconic motifs, such as the Winston Cluster, and employed platinum settings so as to focus on the luminosity and lustre of the stones. Renowned for his keen eye for spectacular diamonds, Harry Winston famously flipped a 2-ct emerald at 3,200 times what he’d paid — at just 12 years old! He went on to own a third of the world’s most celebrated diamonds over his illustrious 70-year career. These included the uncut 726-ct Jonker, the 601-ct Lesotho Brown, the 726.6-ct President Vargas rough, and the blue 45.52-ct Hope, as well as gems associated with famous personalities from Catherine the Great to the Duchess of Windsor and Elizabeth Taylor. While the Winston Legacy joins this family of fabled gems, the Legacy collection bears other connections to the heritage of Harry Winston. 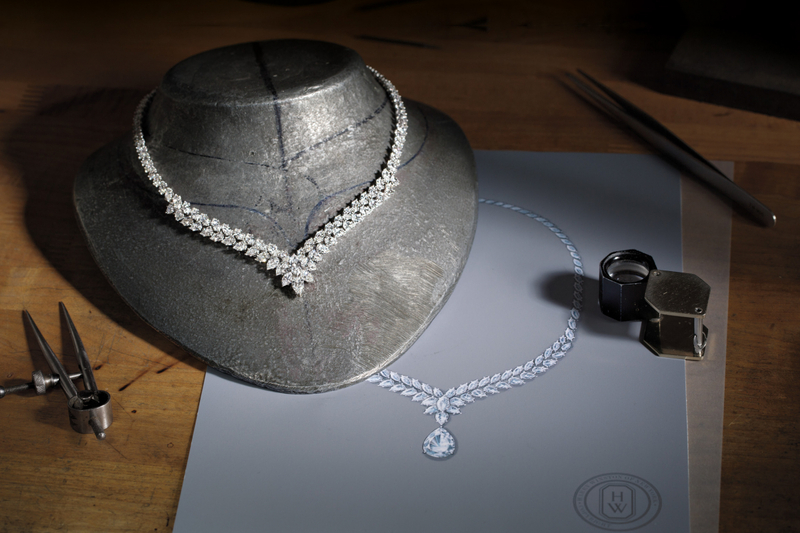 Design legend Maurice Galli, who had been associated with the company for 26 years, conceived a necklace for the Winston Legacy diamond and a necklace in the Legacy collection, before passing on in August 2016. Galli was a frequent collaborator of Ambaji Shinde, the late Goa-born jewellery designer, who created numerous signatures such as the wreath necklace during his 40 years at the workshop and design studio located above the Fifth Avenue flagship salon. The Legacy collection cements Harry Winston’s reputation for timeless design and diamonds of rare beauty and inherent radiance. And the single spectacular stone that spawned this breathtaking range is set to become a new symbol of the brand.